Even if you don’t already have a “garden,” our gardening services might be just what you need. This service is also for your planting bed areas, not normally covered under lawn maintenance. We’re talking about shrubs, perennials, annuals and ground covers. Depending on your needs, we can visit your property, weekly, biweekly, monthly or a few times during the season. Most of our work involves weeding, edging, dead heading (removing spent blooms), pruning as well as disease and insect control. Amendments such as fertilizers or compost will be added to the beds when necessary. We have specialized garden crews led by gardeners that have been with us for over 15 years. They’re sharp and they know horticulture. Our people are really passionate about their work. They know when to prune, how to dead-head, what to weed and how to maintain a gorgeous garden for your property. Thinking About Improving Your Garden? Maybe you’re inspired to make your current garden even more beautiful? Or perhaps you’re wanting to install a garden for the first time but you don’t know how to go about it? We’ve even had customers that tell us they got inspired after a trip down to the Brooklyn Botanical Gardens. They come back wanting to start a garden but have no idea how to begin. 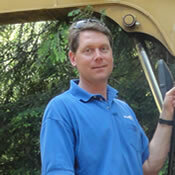 Stefan Karlson has 20 year of experience as a landscape designer. He’s designed and installed many gardens for our customers over the years. “Designing gardens has always been the icing on the cake for me. This is the part of the project that truly completes the landscape. I listen carefully to my clients to find out what they like, what they don’t like and what they hope to get out of their garden. From this conversation I am able to develop a garden scheme that will fit their wish list combining trees, shrubs, perennial and seasonal annuals. Being in nature, surrounded by living things can have a grounding affect on you and your state of mind. We’ve had some customers tell us, that’s the way their home garden makes them feel. Imagine this… what would it be like to relax on a blanket in your backyard surrounded by your flower garden? How would it be to step out into your backyard garden for your morning yoga practice? A new home garden can change the way you experience your life and your property. Your garden will enhance the appearance of typical landscape elements with different timed flower blooms, interesting foliage and other interesting attributes that are harder to obtain in shrubs in trees. Need Gardening Services or Garden Design?